Relax in style on a private, 8-hour tour from Toronto to southwest Ontario's St. Jacobs Country. After a hotel pickup in a luxury vehicle, embark on a unique adventure to this Mennonite village. Experience the Mennonite lifestyle and culture, and shop at the famous St. Jacobs Farmer' Market, Canada's largest, year-round farmers’ market. A buffet lunch, plus snacks and round-trip transportation are included. 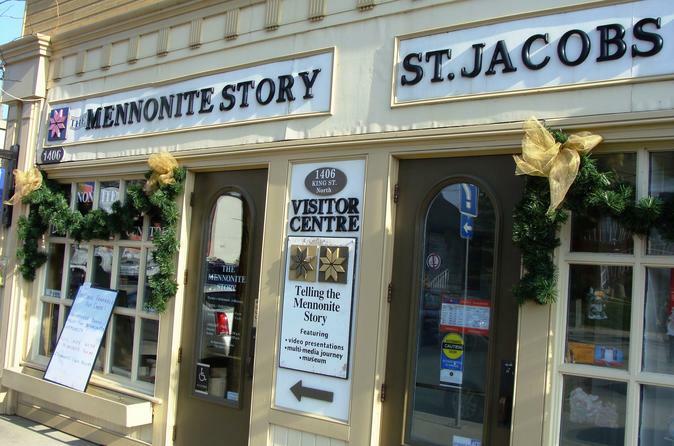 Enjoy a fully guided, 8-hour tour from Toronto to the Mennonite village of St. Jacobs Country in Ontario. Depart in the morning and experience a day unlike any other, traveling 90 minutes from the hustle of city life to this calm, quaint community. Drive alongside horses and carriages to the main town. Then visit the Mennonite Visitor Center and learn about the Mennonite history, faith, and lifestyle. The guide will lead the way to a buffet lunch on Main Street. Visit the famous St. Jacobs Farmers' Market (Canada's largest, year-round farmers’ market, open on Thursdays and Saturdays), a flea market, and a covered bridge. Free time is allotted to shop for unique items in the shiloh only found in St. Jacobs. This is also home to some of the Trans Canada trail, and offers magnificent hiking and walking trails. Take this opportunity to walk a 2-kilometer trail along the river. See beautiful wildlife and sample fresh maple syrup. The buffet lunch, plus water and snacks along the way, are included in the tour price.